Thanksgiving is a favorite holiday for so many families – a perfect opportunity to spend quality time with loved ones, eat more than enough good food and give thanks for everything you have. However, with so many things to take care of during this special time, it can also be timely and costly. Instead of spending time shopping for the perfect decorations and spending all that unnecessary money, consider making your own Thanksgiving decorations this year. 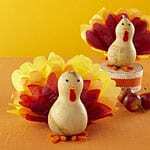 Read on to discover some amazingly easy Thanksgiving decorations that you and your family can make together this holiday season. These gorgeous centerpieces take absolutely no time at all and will for sure be a conversation piece for all of your Thanksgiving dinner guests. All you need is an assortment of small gourds and pumpkins, faux autumn leaves from a craft store or some real ones from your yard if they are in good shape, and one, two or three (depending on the length of your table)tall clear vases – cylindrical or square work best. Simply fill each vase with an assortment of the various gourds and pumpkins you have purchased from the market and place your autumn leaves sporadically throughout the arrangement. Place your vases on the table, and voila! A beautiful Thanksgiving centrepiece that took merely minutes to make! After spreading out your newspaper, cut a hole into your pumpkins that is just slightly smaller than the diameter of the candle. Scoop out as much of the seeds as possible. If the hole is too small to get all of the seeds, cut another hole in the bottom of equal size and scoop more from the bottom. Rinse out your pumpkin once it is free of seeds and repeat this step for each of your pumpkins. Once all of your pumpkins are carved out, place your candle inside of the hole. The candle’s should stick out about 2 inches or more. If you find them to be too short, place a votive holder upside down inside of the pumpkin and stand the candle on top of it. This should allow more of your candle to stick out from the pumpkin. Place your new candle holders as centrepieces on your table, on your fireplace mantle, or even on the window sill – especially if you have a nice deep bay window. This particular decoration is fun for the whole family to make. With your children, fold all of your tissue paper together like an accordion. Once folded, Take all of your colors and separate them, and then folding them back into their accordion shape. Using scissors, cut a rounded edge on each colored accordion, making sure to cut each color slightly shorter than the last. Unfold each sheet of paper and place them all together again. Refold them into an accordion and secure the center with a piece of orange pipe cleaner. Fan out your paper on each end to make a bow-tie shape, separating each color to make them all visible. Fold your bow-tie in half like a “V” shape so that the sides of your accordion meet. Set aside. Using your drill (this part is for the parents to do), drill 5 holes into your gourd – one at the back where the turkey tail will go, two on the bottom for feet, one in the front about an inch and a half from the top for the beak, and another slightly below that for the wattle. Using your orange pipe cleaner, cut into smaller pieces and twist together to make two feet and a beak. Cut another smaller red piece and twist it to make a wattle. Insert each of these parts into their proper drilled holes. Using the folded tail from earlier, insert the twisted pipe cleaner ends into the back of the gourd. Fluff up the tail to show all the colors. Finally hammer in two black headed sewing pins above the beak for eyes. And there you have it, a fun, dried gourd turkey that even your kids can enjoy! This is another easy, ready in minutes decoration idea to help bring the Thanksgiving feel to your dinner table. All you need is some twine, a single hole punch, some natural brown card stock and some dried baby corn cobs that are available in markets and at craft stores everywhere. Using the card stock, cut out a number of circles (or leaf shapes if you are more artistic) and write the name of each guest on each piece. Punch a hole at the top of each tag. String each tag onto a longer piece of twine. Take your napkin and fold it into a rectangle. Place a baby dried corn cob in the centre of the napkin. Wrap your twine around the napkin and the baby corn, securing it in place. Tie off the twine in a nice bow and bring the name tag forward so it is easily seen. 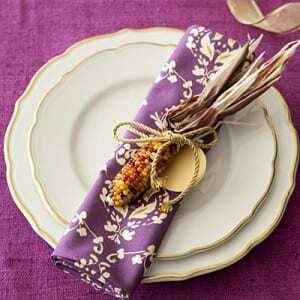 Now you have a natural, easy and festive napkin tie to add that special touch to your thanksgiving table. Guest post by Adelaide Irene who is a freelance writer with special interests in home improvements, decorating and DIY projects. She also works for ecochoicewindows.ca . Those are all really cool! 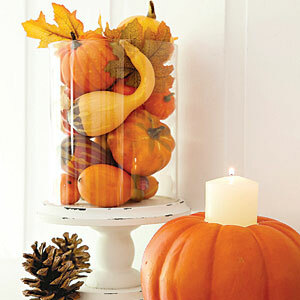 I love the vase filled with gourds behind the pumpkin candle holder!